Lung function peaks during teenage and early adult years. After the early twenties, lung function decreases about 1% a year. In smokers, lung function decreases about 2% a year. Tobacco smoke contains carbon monoxide, a substance that is toxic to the brain. Smoking causes irreparable damage to the lungs. 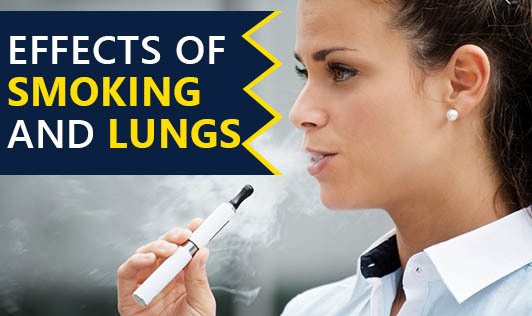 Quitting smoking will help in avoiding further damage of the lung tissues and worsening the lung conditions. Fact - The nicotine trick is the illusion that smoking causes relaxation, when in fact it is only relieving (temporarily) the effects of the stress caused by the previous cigarette. Nicotine is a powerful stimulant. It is only this feeling of anxiety caused by the nicotine that is being reduced, not any real anxiety. If it were necessary to smoke to relieve anxiety then how does the rest of the non-smoking world manage? Are they more stressed than the smokers? Fact - Smoking is a known trigger of allergies and asthma and should not be ignored. Other triggers include pollen, molds, animal dander, dust mites, cockroaches and certain foods. Myth - Lung cancer is the only disease a smoker has to worry about. Fact - Unfortunately, this isn't the case. Smoking causes a number of other lung diseases, including emphysema, a degenerative disease that makes breathing more and more difficult. Smoking also increases your risk of heart disease, particularly if you have high blood pressure or high cholesterol, and aggravates many digestive disorders as well. Fact - There is no known cure for asthma. However, with proper diagnosis and treatment, asthmatics can lead normal and active lives.